Many plastic and rubber manufacturing companies are adopting 3D technology to design and develop new plastic and rubber products. Using this technology designers, engineers and manufacturers are creating new models and mold parts. 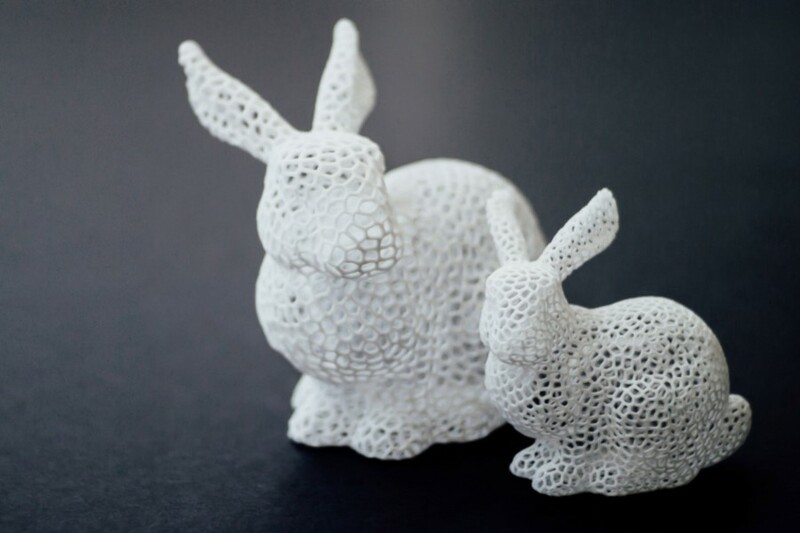 The products made using 3D printers have good mechanical properties like strength and rigidity. For example, Stratasys developed one such color multi-material 3D printer which can combine colors with multi-material 3D printing. The printer uses cyan, magenta and yellow colors and plastics and elastomers as base materials to print objects with wide ranges of flexibility and rigidity, transparency and opacity. 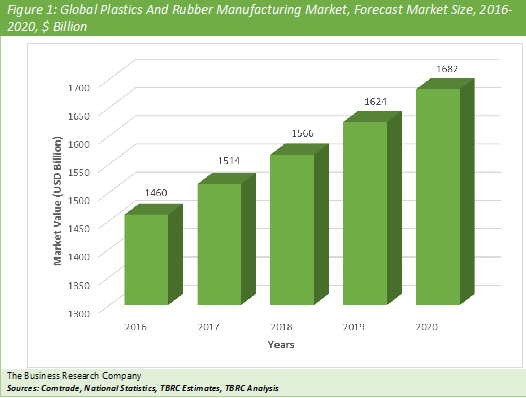 PLASTICS AND RUBBER PRODUCTS MANUFACTURING MARKET TO GROW TO $1.7 TRILLION BY 2020 ACCORDING TO THE BUSINESS RESEARCH COMPANY. The global plastics and rubber products manufacturing market is expected to grow to $1.7 trillion in 2020. Asia was the largest region in the plastics and rubber products manufacturing market in 2016, accounting for $515 billion or 35.3% market share. This can be attributed to high demand for plastic products from the food and beverages and the retail industry in countries such as China and India and tire from the automobile industry. According to The Business Research Company’s Technology Consultant, Abdul Wasay, the textile industry has been shifting from labor intensive manufacturing processes to automated production facilities. Automation has enabled textile manufacturing companies to enhance productivity and reduce production costs. According to a report by Boston Consulting Group (BCG) in 2015, 1.2 million industrial robots are expected to be deployed by 2025, thus indicating increased automation and robotics technology adoption. For example, Swedish company AD Plast, a automotive supplier, installed fifteen ABB robots and four robotized molding machines for automating its production facilities. Bridgestone Firestone Inc. was the largest company in plastic products market with revenues of $31.4 billion for the financial year 2015. The plastics and rubber products industry comprises establishments that manufacture goods by processing plastic and rubber raw materials. Plastics and rubber products are included in the same industry as they have similar technical properties, however they are categorized based on the sole use of either rubber or plastic as raw material in the production of the product. Companies in the industry manufacture plastic bags and bottles, plastic film and sheets, plastic and rubber pipes, plastic foams, rubber hoses and tires. Plastics product companies manufacture packaging materials, film and sheet, foam products, plastic bottles and all other plastic products which have domestic and industrial applications. These companies use polymers and resins as raw materials which are primarily sourced from polymer suppliers and processes used in plastic products manufacturing include compression moulding, extrusion moulding, injection moulding, blow moulding and casting. The chart below shows the year-on-year growth of the global apparel and leather manufacturing market during 2016 - 2020. The plastic products manufacturing industry is further classified as follows Plastics Packaging Materials And Unlaminated Film And Sheet market include companies that produce plastics packaging materials and unlaminated film and sheet from polythene, polypropylene and other polymers. These products are used for packaging in industries such as food, machinery and other consumer goods. Plastic Bottle market comprises companies that produce plastic bottles from PET, BPAs and other polymeric resins. These products are used for packaging in industries such as food and pharmaceuticals. Plastic Pipe, Pipe Fitting, And Unlaminated Profile Shape include companies that manufacture plastic pipe, pipe fitting, and unlaminated profile shape from PVC and PVDCs. These products are widely used in agriculture, utilities and construction industries. Polystyrene Foam market comprise establishments that produce polystyrene foams from polystyrene which are used in the packaging and the construction industry. Urethane And Other Foam market include companies that produce urethane and other foams from polyurethane and polymers which are used in the construction and the packaging industry. Laminated Plastics, Sheets And Shapes market comprises companies that produce laminated plastics, sheets and shapes from PE, PP and other polymers which are predominantly used in construction industries. Plastic manufacturing companies procure polymers and resins processes used in plastic products manufacturing include compression moulding, extrusion moulding, injection moulding, blow moulding and casting. The plastics products industry also include plastics plumbing fixtures, polystyrene foam product, plastic dinnerware manufacturing, plastic gloves, clothes, cups and other manufacturing industries. Polymers and resins procure raw materials from polymer suppliers and perform processes such as compression moulding, extrusion moulding, injection moulding, blow moulding and casting to produce plastic products. Rubber Product market comprises companies that manufacture tires and retreading, rubber hoses and belting, rubber sealants and all other rubber products which have domestic and industrial applications. The rubber products manufacturing industry is further classified as follows Tire manufacturing include companies that manufacture tires from natural and synthetic rubbers and other polymeric raw materials. These products are used in automobiles and industrial heavy vehicles. Rubber Hoses And Belting comprise establishments that manufacture rubber hoses and belting from synthetic and natural rubber which are used for industrial and domestic purposes. Plastics And Rubber Products Manufacturing Global Market Briefing is a detailed report giving a unique insight into this market. The report is priced at $1000 for an individual user. To use across your office the price is $1500 and $2000 if you wish to use across a multinational company. About The Business Research Company Visit TheBusinessResearchCompany.com, mail info@tbrc.info or call +447443439350 or +918897263534 or +919160996838 for more information on this and many other titles. The Business Research Company is a market research and intelligence company, which excels in company, market and consumer research. It has research professionals at its offices in the UK, India and the US as well a network of trained researchers globally. It has specialist consultants in a wide range of industries including manufacturing, healthcare, chemicals and technology. The Business Research Company's management has more than 20 years of varied business research experience. They have delivered hundreds of research projects to the senior management of some of the world's largest organizations.